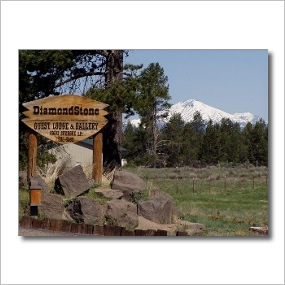 DiamondStone offers peaceful, rural lodging, B&B, log cabin, vacation rentals large and small. Private spaces for special memories. River access and motorcycle rentals onsite. Event Center. Centrally located to Crater Lake, Newberry Monument, Mt Bachelor, Sunriver and La Pine. Family friendly, pet friendly, LGBT friendly. East Lake is a spectacularly scenic vacation, geologic and archeologic wonderland. Situated in the Newberry National Volcanic Monument Caldera at just under 6,400 feet elevation, the lake is fed by snowmelt and underground springs. Retreat for families and corporations with activities such as skiing, golfing, rafting, horseback riding, and fly-fishing. Nestled along the beautiful Deschutes River in the heart of Bend. Offers winter and summer recreational activities, meeting and convention space, and more. Guest ranch offering programs for family vacationers in the summer and conference center facilities for groups the rest of the year. Nestled among giant Ponderosa pine trees just east of the Santiam Pass. Black Butte Ranch is a haven to anyone seeking a get-away. With championship golfing, award winning dining, breathtaking views, and recreation at every turn. Located on the dry side of the Cascade Mountain range, Sunriver Resort offers a unique vacation experience for all ages. For a memorable golf outing, quality family vacation, or that important corporate meeting, our facilities and services remain unmatched! On the Metolius river with 1 acre riverfront lawn & footbridge to Camp Sherman. 45 full hook-up sites with large patios under the ponderosa pines plus 5 river front cabins.